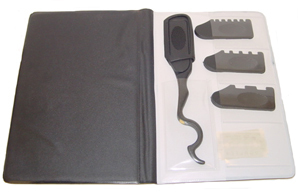 * Black plastic handle and steel blade gives a rich appearance. 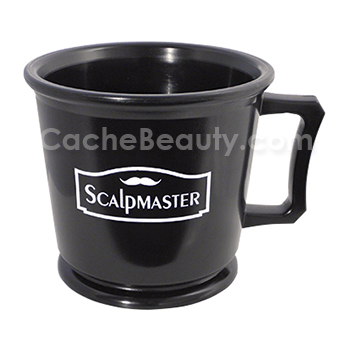 * Perfect tool for stylist and barber. 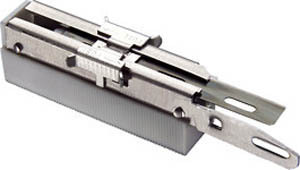 * Fully opened length is 9-1/2"
* Closed length is 6-1/4"
Important Advice to the User. 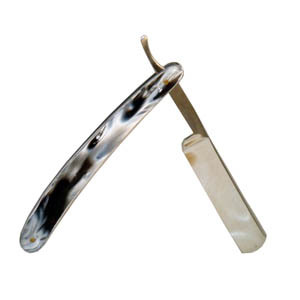 The blade of your open straight razor has a very fine and vulnerable cutting edge. 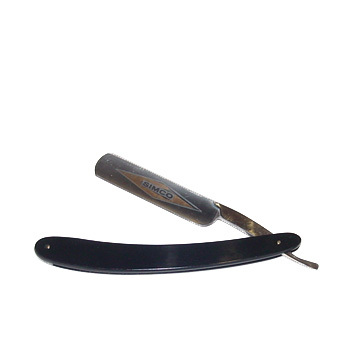 Touching it or cutting materials other than beard hair, or using it for other than its intended purpose will damage or destroy it. 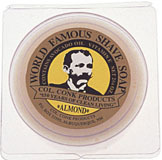 Therefore a direct contact with the skin should only occur during the shaving session. 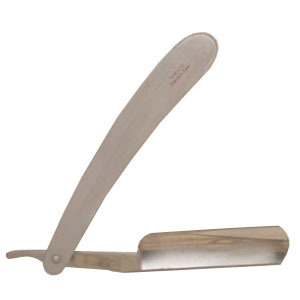 Gentle stropping of the blade before shaving maintains the blade's cutting ability for several months, while too much pressure onto the strop will cause damage to the fine cutting edge. 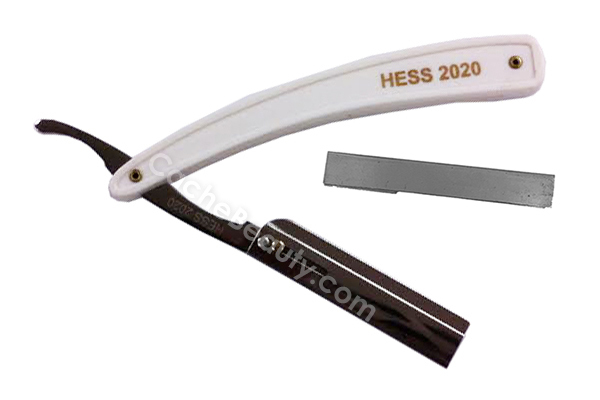 Blades of open straight razors are made of stainless or carbon steel and therefore require a particular diligence and maintenance. 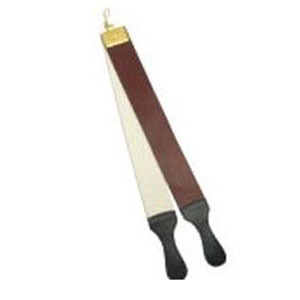 Blade and handle have to be cleaned and dried carefully after use. 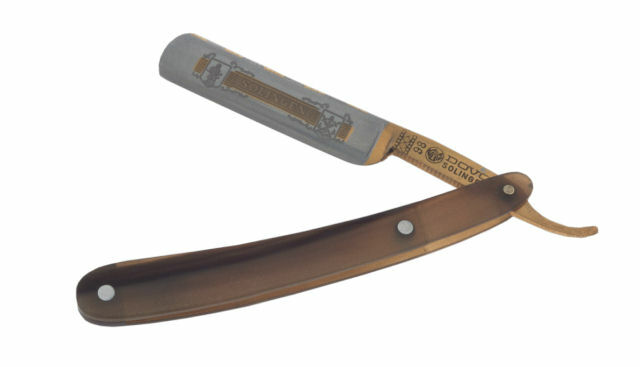 For long term storage the blade should be lightly oiled, and the open straight razor be kept in a dry environment. 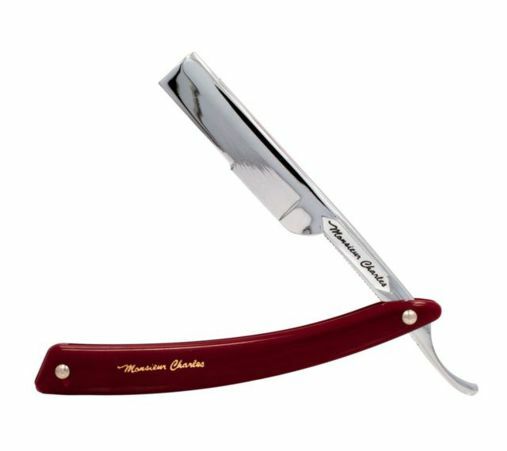 * Fully opened length is 9-3/4"
* Closed length is 6-3/8"
Ultimate Pro # 150 Straight Razor This Razor is currently unavailable ! 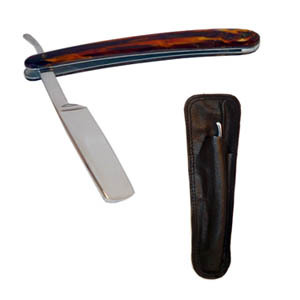 Fully opened length is 9-1/2"
* Closed Dimension: 1-1/8" wide x 6-3/8" Long x 7/16" Thick * Open Length 10"
* All Stainless Steel Straight Razor 5/8" Round Tip is Finest available. 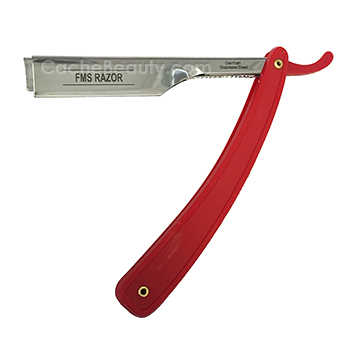 * Solid Stainless Steel Blade * Closed Dimension: 1-1/8" wide x 6-3/8" Long x 7/16" Thick * Open Length 10"
* Heavy duty red translucsent handle, brass pins and finely finished smooth chrome plated blade-carriage. 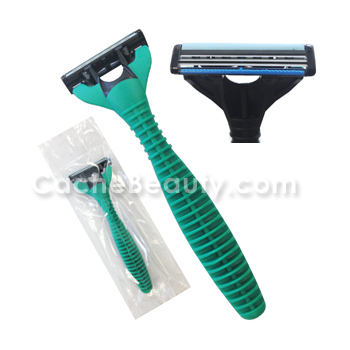 * Razor comes packaged in clear plastic sheath with instructions printed on back. 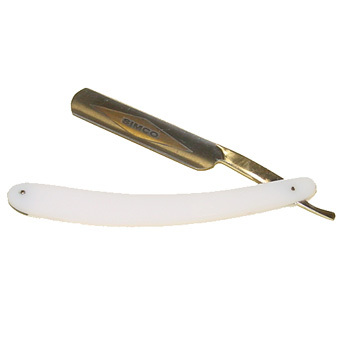 * Blade Holding End is Metal with length of 5-1/2"
* White Plastic Handle Length 5-1/4"
The main differences between the original razor and the new one is that the original had a white handle and this has a cream color handle (we wanted to make sure people knew this was a different razor) and the handle is riveted together rather than being held together with pins. 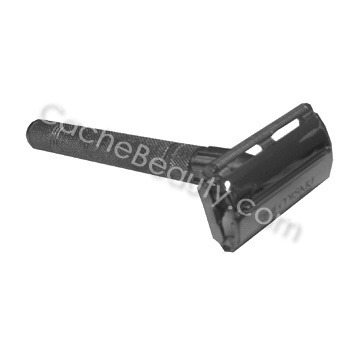 Over time the handle on the #1010 EZY Shave Razor would crack near one of the pins. We do not expect to have that problem with these razors. 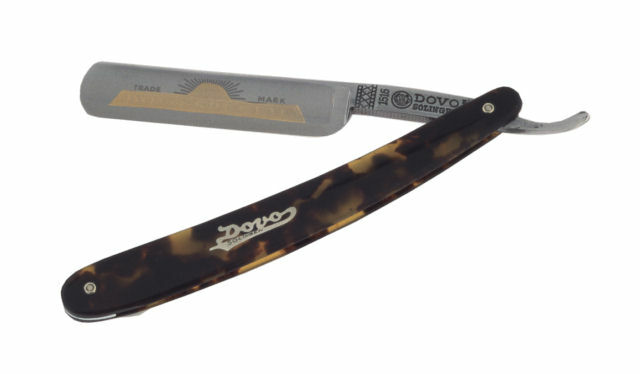 Fully opened length is 9"
Please note this injector razor has been DISCONTINUED as the manufacture in Japan has not been able to produce this razor. We believe they are out of business because we can not contact them for over 2 years. 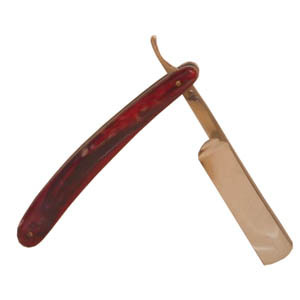 * 5/8" round tip Straight Razor. * Closed length is 6"
as of 03/20/15 one (1) in Stock, ready to Ship !!! 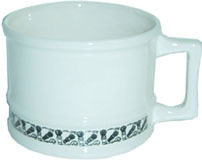 "Regularly Priced at $ 236.00 "
"Regularly Priced at $ 236.00"
* Virtually Unbreakable makes it a Great Travel Companion ! 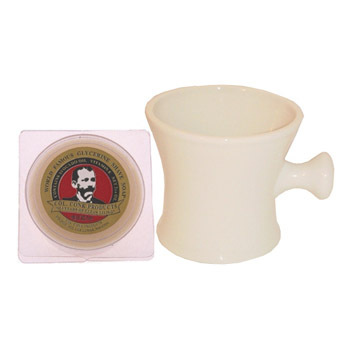 * Inside Dimension: Bottom Ring (area to hold shaving soap bar) 2.25" diameter: Overall Inside Diameter 3.0"
* Inside Ring Small enough to hold the Smallest Soap Puck and Overall Inside is Large enough to hold the Largest Soap Puck ! 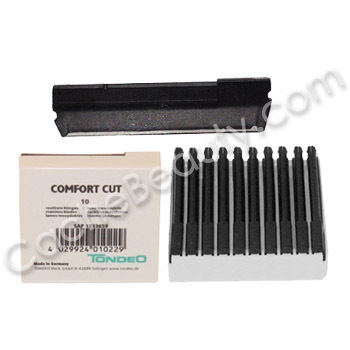 Comfort Coated Injector Blades are tested to provide consistent, smooth, comfortable shaves. 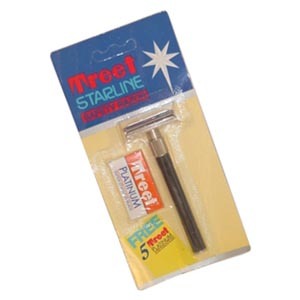 * Each edge is precisely honed, then coated with Platinum Chrome to provide hardness and durability. * 20 Blades per Dispenser. 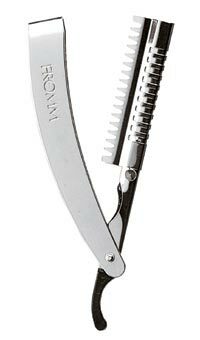 * Was called "Personna Injector Blades"
A faster, painless way to shape your eyebrows. 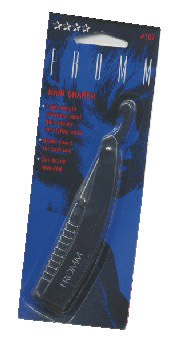 The shaper may also be used to remove hair from face, neck, arms and bikini area. 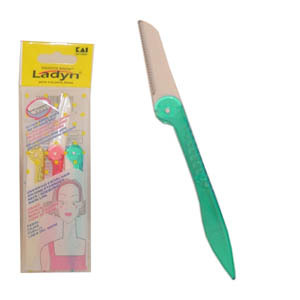 Specially designed for styling eyebrows. 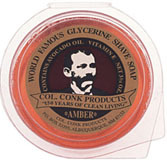 Suitable for shaving facial hair for a smooth make-up application. Good for trimming excessive hair around the nape of the neck. 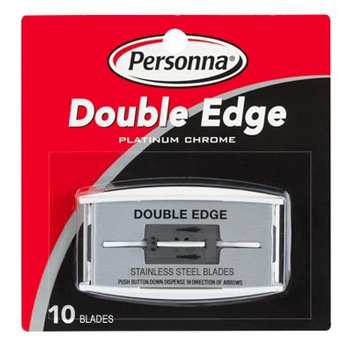 Personna Double Edge blades are made of high quality steel and are electronically controlled throughout the grinding and honing process to help provide smooth shaving performance and comfort. 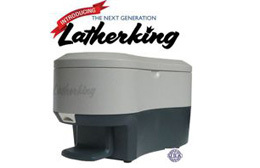 Combining all the innovative features makes for a totally new razor cutting experience. 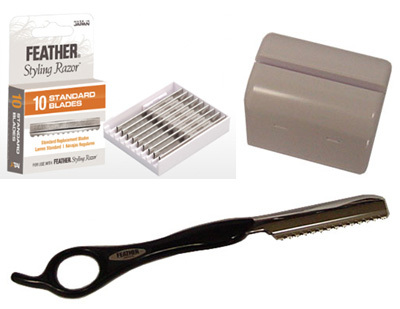 Razor is sold in a kit format that contains a standard razor, 10 replacement blades and a disposal case. Spice up your styling! 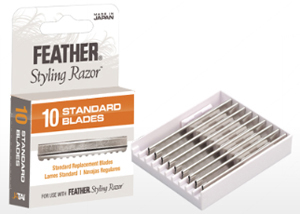 Feather has created the most innovative razor in the world today. 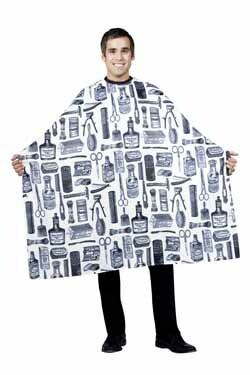 Made for today's stylist it has become the razor of choice for over a half a million stylists in the world and for good reasons. First, the ergonomic design of a rigid handle does not require constant pressure in holding open like conventional razors. 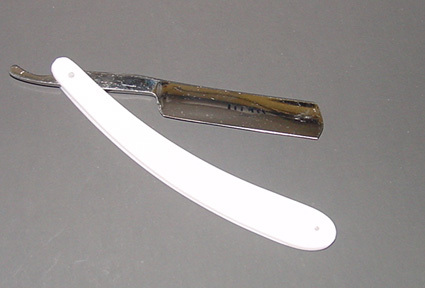 Second the balance and feel in the hand makes the razor become an extension of one's hand. 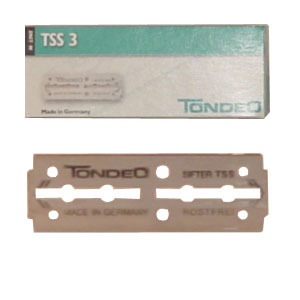 Third, the blades are completely safe to you and your client. 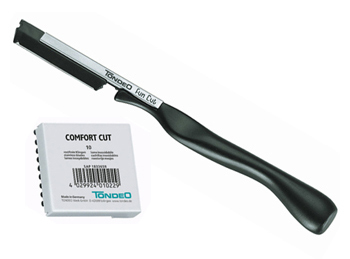 Fourth, blades are changed using the no touch blade system and fifth, the cutting performance of the blades surpasses any other replacement blade razor on the market today. 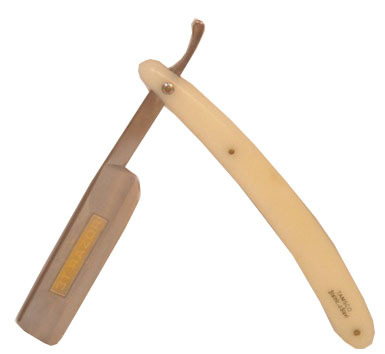 The Texturizing Razor uses a special "texturizing" blade which cuts half the hair that the standard blade does. Perfect for feathering, adding volume and giving texture to the hair. 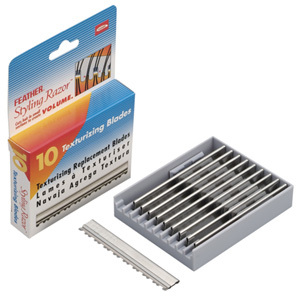 Surgically sharp and precise blades are packed 10 blades to a dispenser. 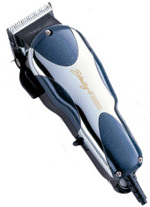 The cutting edge is made for shaping hair and not for shaving giving you the cutting control you need to be creative. 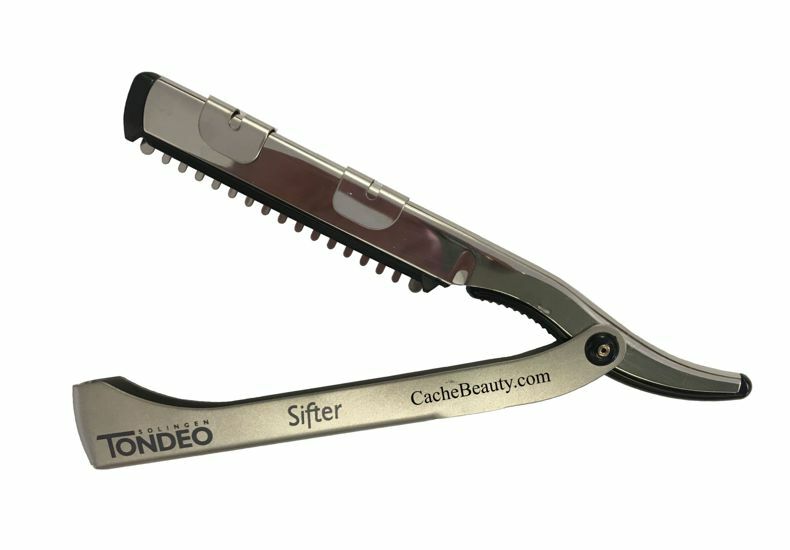 The blade fit snuggly in the handle and does not chatter or move when cutting so the blade and handle act as one piece. 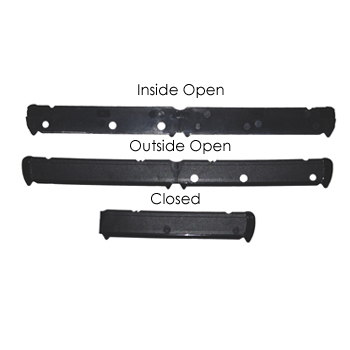 For your complete safety we built a patented blade guard on each of the blades which prevents the guard from moving and exposing the blade. 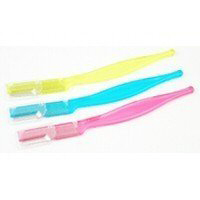 This also prevents hair from clogging between the guard and blade. 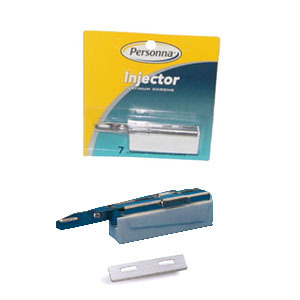 Surgically sharp and precise blades are packed 10 blades to a dispenser. 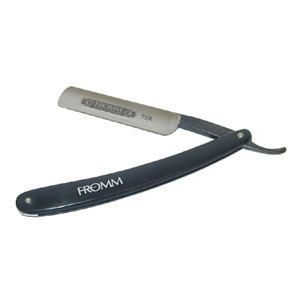 The cutting edge is made for shaping hair and not for shaving. Giving you the cutting control you need to be creative. The blade fits snuggly in the handle and does not chatter or move when cutting so the blade and handle act as one piece. 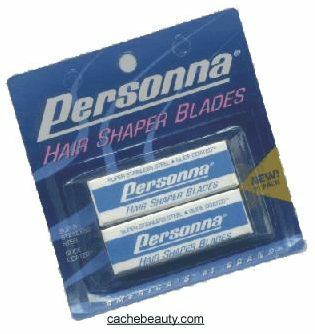 These blades are notched in between to blend evenly through the hair. For your complete safety we built a patented blade guard on each of the blades which prevents the guard from moving and exposing the blade. 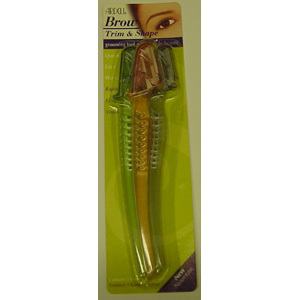 This also prevents hair from clogging between the guard and blade. * Cuts hair in small sections to create VOLUME. 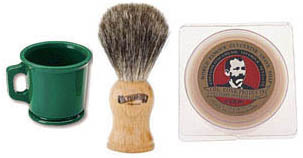 * For a limited time, this comes with a FREE shear / razor case! 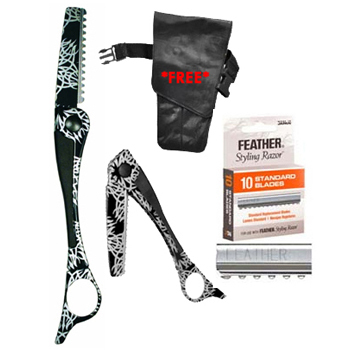 * For a limited time, a shear / razor case is included for FREE! 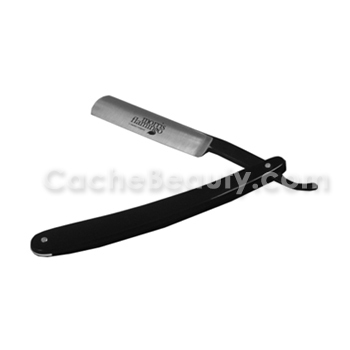 A Chrome Nitride Platinum Triple Harden Stainless Steel Blade with Teflon layer that Optimizes the Glide ability which provides Longer Durability and Increased Sharpness. 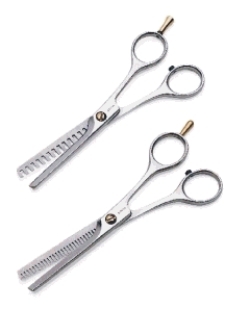 5 Tooth Thinning head, 3 Tooth texturizing head, 1 Tooth Slide Cut & Plain Cutting head. 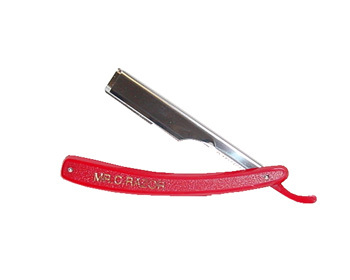 This razor blade is profiled after the French straight razor edge to give you a true hair styling razor. 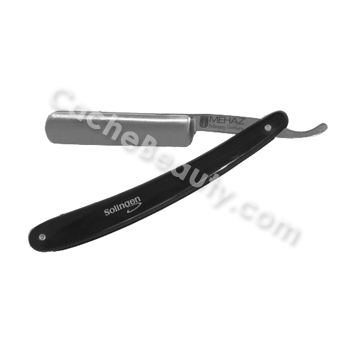 Its performance is like no other razor blade found in the market today. 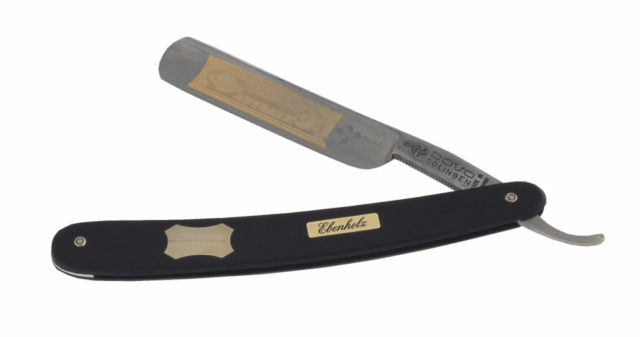 The blade has a unique shape that locks itself into the razor so when pressure is applied it will not move or chatter when cutting. 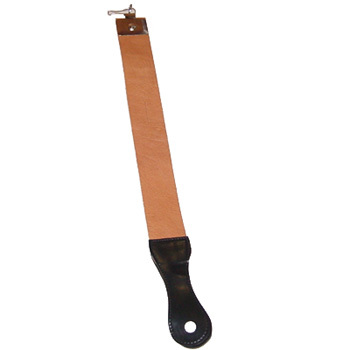 Handcrafted, exceptional strops from the only manufacturer in the United States. Complete with sharpening canvas and swivel. 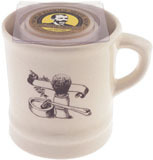 * Complete with Cowhide, Sharpening Canvas and Swivel. * Cowhide with handle.1-3/4" X 20"
* Canvas with handle.1-3/4" X 20"
* Complete with Horsehide, Sharpening Canvas and Swivel hanging clip. 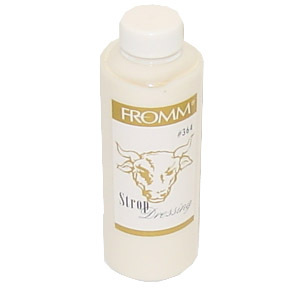 * Cowhide with handle 2-1/2" X 23-1/2"
* Canvas with handle 2-1/2" X 23-1/2"
Directions: Using a soft cloth and a circular motion rub dressing into the face of the leather. Let dry 24 hours. Repeat. Some stain in the leather may rub out while applying. This is normal and not a cause for alarm.